Potato virus Y (PVY) is a serious threat to the seed potato industry—it is a widespread disease with many different host plants that is spread to potatoes by aphids. Since seed tubers must be virtually virus-free and pass multiple tests in order to meet the stringent standards needed by commercial growers to produce the high quality tubers demanded by consumers, keeping seed tubers free from viruses presents an enormous challenge to seed growers. PVY is carried on the tips of the aphid’s needle-like mouthparts (the rostrum) and can be picked up and transmitted during feeding probes, which last only seconds! Because of this, it is extremely challenging to combat this problem using conventional insecticides. Research has been conducted using mineral oils sprayed on leaf surfaces to disrupt probing and reduce virus spread, but this needs to be timed correctly since plants will suffocate if they are always covered with oil. To effectively manage PVY spread, it is important to know two things 1) which aphids can spread the virus AND 2) when they are most likely to be found in seed potato fields. Since there are many different aphid species that infest a wide variety of plants, it is essential to accurately identify species that both feed on potatoes and can transmit PVY. Understanding how aphid populations move is also important. Typically, aphids build up in large numbers on plants, and when the population becomes too crowded, winged individuals are produced. These winged aphids (which can number in the billions) can then fly or be carried with the wind many miles to seek new food sources. Many of these dispersal flights originate in southern and central areas of WI where PVY is present in many different host plants and the virus can easily end up in the isolated northern counties where seed potatoes are grown. To track dispersal flights of a typical aphid species, such as the soybean aphid that may impact many crops, including potato, a multi-state trap network has been established throughout the Midwest to monitor its occurrence in both potato and soybean fields (see next week’s New Family Farms release for the full soybean aphid story of how 3 invasive species have combined to produce serious pest threats in 3 different ecosystems). So far, 50 aphid species have been identified that transmit PVY from plant to plant, although the level of efficiency varies between species. 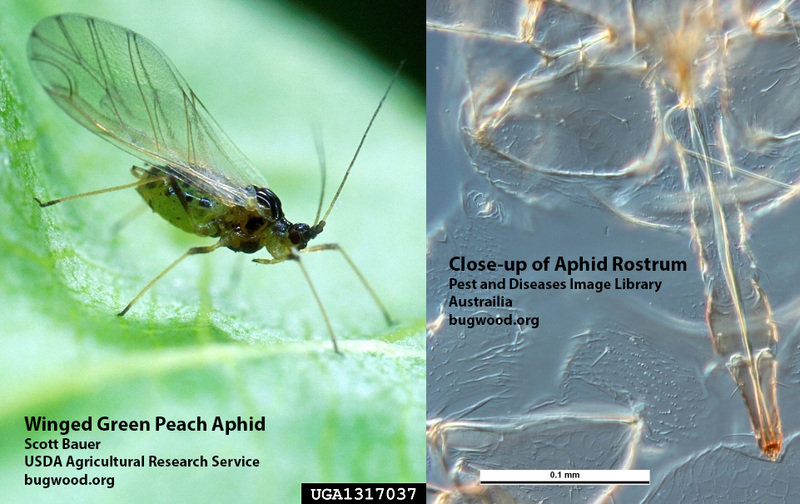 Some aphids, such as the green peach aphid can reach 50% efficiency, while others, such as aphids from soybean, corn and grains, are far less efficient. It is important to understand that both can be equal threats when high populations occur. In my research, I determine the diversity of winged aphids that are present in potato production areas of Wisconsin and diagnose when these flights regularly occur. During the 2010 and 2011 field seasons, I monitored winged aphids in three major potato growing areas of Wisconsin (covering commercial production in central and southwest counties and seed in northeastern Langlade County). Almost 5,000 winged aphids were collected and identified over this two-year period. Specie diversity varied greatly among these regions, and different aphid species were collected at different times. Since we know how efficient most species are in transmitting PVV, this research will provide seed potato growers with valuable information on the potential risk of PVY spread. Ultimately, this will enable seed growers to develop more effective protocols for controlling the virus with carefully-targeted oil sprays to disrupt probing and guarantee a continuing supply of high-quality, disease-free tubers for table stock growers. For more information contact: Natalie Hernandez (nmhernandez13@gmail.com) or Dr. Russ Groves (groves@entomology.wisc.edu). It’s July in northeast Wisconsin. 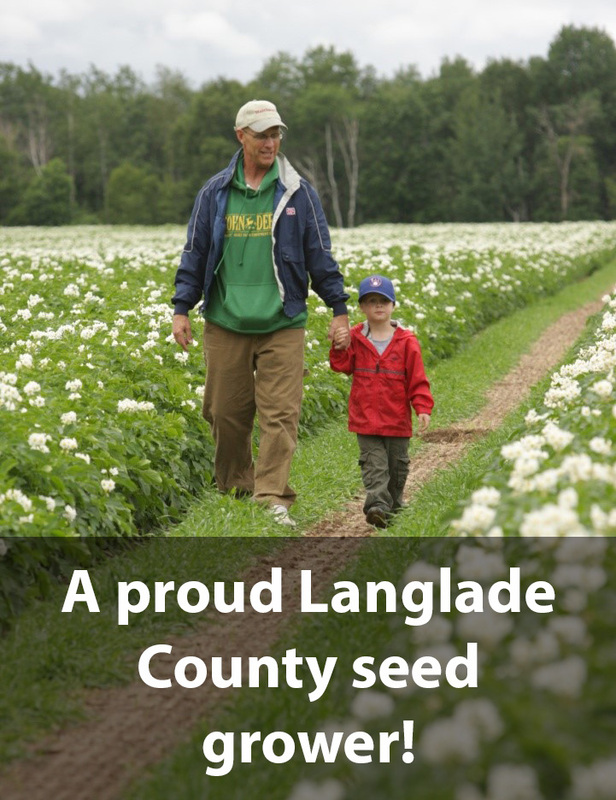 The air is fresh, the birds are chirping, and the potato fields on the isolated seed potato farm in Langlade County are a healthy green. This is a highly-specialized farm where precious disease-free tubers from the state’s elite seed farm are carefully nursed to supply the diverse requirements of commercial growers. Everything on the seed farm seems to be going well this year, and even the eagle-eyed inspectors have not found any evidence of disease. The farmer looks up at the bluebird sky and smiles at the promise of a warm summer day, unaware that a silent enemy may be approaching. In swirls and currents of air coming from the south, a scattering of feather-light insects is alighting unseen on the edges of his fields. They are anxious to insert their needle-sharp mouthparts into the leaves and begin feeding. These are aphids, which act as unwitting flying hypodermics, quietly moving from one plant to the next, sampling the sap they need to live. These harmless creatures are from southern growing areas where a myriad of crops exist that can potentially infect them with any number of virus diseases that they can carry to potatoes. Unlike the July sky, the enemy the aphids carry promises trouble.